Chief Justice Tani G. Cantil-Sakauye has appointed three new voting members and four new advisory (nonvoting) members to the Judicial Council. She also reappointed two voting members and one advisory member. Judge Jonathan B. Conklin, Superior Court of Fresno County, will serve in a voting position through September 14, 2021, succeeding Judge Kevin C. Brazile. Judge Conklin served as presiding judge of the Fresno court from January 2014 through December 2015, and as assistant presiding judge for 2013. He chairs the Judicial Council’s Trial Court Budget Advisory Committee. Judge Scott Gordon, Superior Court of Los Angeles County, will serve in a voting position through September 14, 2021, succeeding Judge Gary Nadler. Judge Gordon currently serves as an advisory member of the Judicial Council. He is the assistant supervising judge of his court’s Criminal Division and has also served as supervising judge in the Family Law Division. Administrative Presiding Justice Brad R. Hill, Court of Appeal, Fifth Appellate District, will serve in a voting position through September 14, 2021, succeeding Justice James M. Humes. Justice Hill previously served on the Judicial Council from 2000 to 2003 and from 2007 to 2010. He chairs the Judicial Council’s Court Facilities Advisory Committee and is a member of the council’s Trial Court Facility Modification Advisory Committee. Presiding Judge Ann C. Moorman, Superior Court of Mendocino County, will serve in an advisory position through September 14, 2021. Prior to her appointment to the bench in 2011, she practiced law for 23 years and served as president of California Attorneys for Criminal Justice—a statewide organization representing attorneys and investigators in the defense bar. She serves on the Judicial Council’s Trial Court Presiding Judges Advisory Committee. Nancy Eberhardt, Court Executive Officer, Superior Court of San Bernardino County, will serve in an advisory position through September 14, 2021, succeeding Jake M. Chatters. She has worked in trial court operations for 27 years and currently serves on the Judicial Council’s Court Executives Advisory Committee and the council’s Trial Court Budget Advisory Committee. Judge Kyle S. Brodie, Superior Court of San Bernardino County, has been reappointed to a voting position through September 14, 2021. Prior to his judicial appointment, Judge Brodie worked for 12 years as a deputy attorney general in the California Attorney General’s Office. He currently chairs his court's technology committee and has helped to manage the implementation of its new case management system. Presiding Judge Gary Nadler, Superior Court of Sonoma County, will serve in an advisory position through September 14, 2019, succeeding Presiding Judge Patricia Lucas, the current chair of the Judicial Council’s Trial Court Presiding Judges Advisory Committee. Judge Nadler currently serves as a voting member of the Judicial Council. He is vice-chair of the council’s Technology Committee and its Policy Coordination and Liaison Committee, and serves on the council’s Executive and Planning Committee and its Budget Committee. 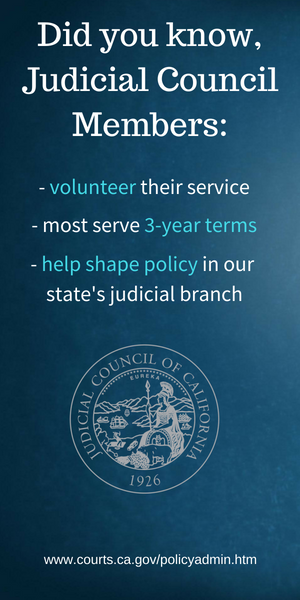 Judge Paul A. Bacigalupo, Superior Court of Los Angeles County, was appointed to an advisory position on the council through September 14, 2019, as he will succeed Judge Stuart M. Rice as president of the California Judges Association. Kimberly Flener, Court Executive Officer, Superior Court of Butte County, has been reappointed to an advisory position through September 14, 2019. She joined the court in 2006 as an executive program analyst and has worked in several program areas such as the court’s award-winning Court Clerk Certification Promotional Opportunity Program. She currently serves on the Executive Committee of the Judicial Council’s Court Executives Advisory Committee. On May 1 of this year, the Chief Justice appointed Commissioner Rebecca Wightman, Superior Court of San Francisco County, to serve in an advisory position on the council through September 14, 2020, succeeding Judge Shama Hakim Mesiwala. Since 2000, Commissioner Rebecca Wightman has served as a family law commissioner for the Superior Court of San Francisco County. In addition to the Chief Justice’s appointments, Patrick Kelly, attorney and regional managing Partner at Wilson Elser Moskowitz Edelman & Dicker, was reappointed to a voting position on the council through September 14, 2021, by the State Bar Board of Trustees.